My last sermon was entitled, “what kind of King is your Jesus?” and our focus was on verse 15 where we saw that the people who were blessed by the miracle of the feeding of the 5000 tried to make Jesus King by force. Sadly their action was based on their own selfish reasons. They needed a deliverer from the yoke of Rome that was so heavily upon them. But unfortunately, their motives were wrong. Instead of falling in adoration before Him, they decided that they wanted to use Him for their own selfish ends. Sadly for them Jesus did not accept their desire to make Him King. Rather, according to the Gospels of Matthew and Mark Jesus told the crowd to go away after dismissing His disciples? You see, Jesus Christ never commits Himself to thrill seekers; He never commits Himself to false disciples, the ministry of Jesus continues only with those who are really His disciples and who will follow Him for the right reason as we will see in His dealings with His own disciples this morning. According to Matthew and Mark He did not only dismiss the crowds, but He told His disciples to get into the boats and to cross over Galilee to Capernaum. Now for the next two sermons I want to unpack from the text before us two categories of people. The one category we can call true disciples and the other category false disciples which we will look at next time. We can call it by other names. We can call it those who are of the faith and those who pretend to be of the faith, or we can call it the true followers and then on the other hand the misled or phony seekers. Today we are going to look at “true disciples growing in faith” and next week we will look at “phony seekers shrinking away from the faith”. The section before us is a remarkable section as it contains in the story 4 miracles. We see Jesus walking on the water, then Matthew tells us that Peter walked on the water at least a little bit, then Matthew and Mark told us that when Jesus got into the boat the wind or storm immediately stopped and lastly John tells us that the boat somehow traversed to where they were going and immediately they reached the land. So here we see the disciples crossing over Galilee, a strong wind comes up, this time Jesus is not sleeping in the boat, but He is in the mountain praying and here they are struggling by themselves for about 4.8 – 5.6 kilometres against this wind. And as this story unfolds we see in verses 16-21 at least three characteristics of true disciples who are growing in their faith and we are going to stand still with that this morning. Now there are various ways that theologians approach this section. Most make a big deal about the walking on the water issue with Peter and that we need to keep our eyes on Jesus in life’s storms otherwise we will sink. 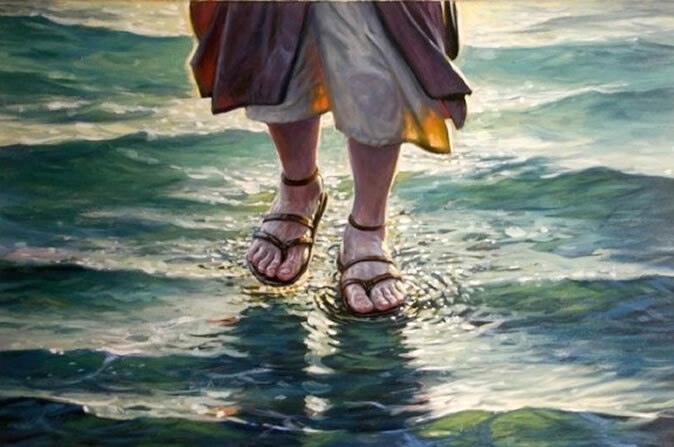 Others make a big deal of the issue that we should be able to walk on water because greater things than what Christ did we should do. I guess we can talk about the storms of life, as we know that Christ is the answer to all we face, but I do not think that John wrote this to draw allegorical lessons out of it. What I want to do this morning is highlight three Characteristics of a true disciple and we will see that true disciples are obedient, they desire the presence of God and that they worship Him and guess what, when these three are in place it is amazing just how much we enjoy from the hand of God. Point 1. True disciples are obedient. According to verse 16 of John they went out to sea, but again if you read Matthew and Mark you will know that they did this upon the command of Christ. Mark 6:45 (ESV) “45 Immediately he made his disciples get into the boat and go before him to the other side, to Bethsaida, while he dismissed the crowd.” We read the same in Matthew 14:22. What might seem insignificant at first glance is of utmost importance and that is that they again obeyed immediately. One of the lessons we learnt about the disciples in the whole miracle of the multiplying of the bread and fish is that even though they failed the test of faith they were right there when it came to obedience. They had no idea what Christ was going to do and had no idea of the extent to which He would display His deity and glory, but when He told them to see what food the crowd had, they obeyed, and when He told them to have the people sit down in groups they did just that. What a faith growing experience that was? They simply obeyed, but what Jesus did far exceeded their obedience. In the same way, when we obey even when we lack faith we actually grow in our faith and now in this story it is no different. Now I cannot read the minds of people at any time especially 2000 years later, so I cannot tell you what the disciples thought, but it must have seemed strange to them that their Master was sending them away to the other side – yet they obeyed. This is one of the greatest marks of genuine discipleship. Genuine, real discipleship trusts in the sovereignty of God at all times and is founded on unquestioning, unhesitating trust and obedience. We don’t darken God’s counsel as we saw from the book of Job last week. We don’t argue with God. We are not seated on God’s throne so even though we don’t always have the answers to our questions, we simply do it. This was the very message of Mary to the servants in Acts 2. ‘Whatever He says to you do it’. It is very clear that the disciples were starting to understand this. It's a matter of not my will, but His will be done as mysterious as it may be. And so we see the disciple obeying. The true crux of discipleship is obedience that asks no questions, obedience that expects no explanation, a blind believing/trusting obedience. And so these disciples in just a simple little way were obedient to Christ and it opened them up to one of the most fantastic miracles that Christ ever did, and what a faith growing experience that was for them. Point 2. True disciples need the presence of Christ. Now there is no verse in any of the three gospels that say it explicitly, so let me share with you how I get there. When reading the Scriptures we are allowed to observe and ask questions from the text, questions like, who, what, where, when etc. and it is this little question of ‘when’ that opens some thoughts for me. Verse 18 tells us “a strong wind was blowing and the waters grew rough,” and according to verse 17 Jesus was not yet with them. Matthew and Mark tell us it was really some storm. I’ve been on the Sea of Galilee when we experienced some windstorm. The only difference was that I believe the storm was not nearly as bad as when they were on the sea that night, also we were in a much bigger boat and we had strong engines. But a few of our touring team members got sea sick. If you study the Sea of Galilee you will notice that it is surrounded by some Valleys and gorges on the western side. The Sea of Galilee is approximately 220 meters below the Mediterranean Sea so you have these winds coming off the Mediterranean down these gorges hitting the Sea of Galilee at times causing very big waves. So here they are fighting the storm. Matthew tells us that it was the fourth watch when Jesus came walking on the water which will be between 03:00 and 06:00 in the morning, so they have been struggling for at least 9 hours to row app. 5-6 km. Now remember Mark tells us in Mark 4 of the occasion where Jesus was asleep in the boat when the storm broke out, but when they woke Him, He simply commanded the storm and it was quiet. Now you tell me in a storm like this if they would desire the presence of Christ or not. Surely they did, and the very fact is highlighted when Jesus got into the boat they fell at His feet and worshipped Him. Let’s be honest. If I am a true disciple of Christ, surely I would want to obey Him, even when I do not understand His commands, and I would like to know that He is present and that I live in His presence all the time. True discipleship has to be demonstrated by an absolute trust in the sovereignty and presence of God, no matter what we face in life. Now we could ask why Jesus did not join them from the beginning, why did they have to go through the storm in the first place why did Christ not just prevent the storm in the first place? In this context, an omnipotent God could wait as long as He wanted to because He was in absolute control over the sea and everything else all of the time. Does God not control the things below, the things above, the things out there in space, the animals and all that dwells on this earth and in the waters at the same time? Omnipotence is always combined with infinite wisdom and infinite love at the same time and it always acts at the right time and what Christ did with His disciples on the sea was right and had purpose and the timing of Christ was right because of who He is. And so in His time we see Christ appearing on the water. No, He did not know where the wall was, and He was not walking in the dark on land and it simply appeared as if He was walking on water. All three Gospels are clear in that regard. The event was so strange to them that they thought it was a ghost. And so Jesus meets them when they most need Him. If their desire was really to have Jesus present, well their prayers were answered. The desire to be with Jesus was so great that Matthew records how Peter desired to leave the boat and the storm they were facing and just to go and be with Jesus where He was at. Even when Peter walked on the water we saw the whole issue of our sermon namely obedience and being with Christ personified. In Matthew 14:28 (NIV) we read of Peter saying: 28 “Lord, if it’s you,” Peter replied, “tell me to come to you on the water.” There was nothing of Lord tell me how you defy the law of gravity and what will happen if I sink. He just wanted to go to be with Jesus. And the moment Jesus said ‘come’, he was out of the boat heading to Jesus. Again He failed the test of faith, but man, he was spot on as far as his obedience was concerned. I cannot confirm this, but the way it is written sounds miraculous as within a second they travelled a few kilometers. Are we true disciples who have a hungering and a desire just to live in the presence of Christ, the one who said: And behold, I am with you always, to the end of the age. Point 3. True disciples worship Christ. Now John by the way did not even need to make this statement as it is the overarching purpose of his writing. Here Matthew tells us that what John purposed in writing is exactly what was experienced by the disciples. John says: “that you may believe that Jesus is the Christ, the Son of God,” Matthew records the response of the disciples during these four miracles: “Truly, you are the Son of God.” These disciples grew in their faith, but their faith drove them to worship. It was not faith in faith as we so often see, or faith in the miracles but faith in Christ as the Son of God that caused them to worship. You notice that the disciples do not desire more miracles. They followed the Son and Christ did what He wanted to when He wanted to. When we looked at the miracle of the feeding of the multitude it was back to normal meals for the disciples the next day. It was not suddenly an attitude of Lord, here is our menu. What about smoked lobster today, and can we try some steak smothered with mussels and cream tomorrow and what about …….., no it was all about worship, recognizing that they were living in the presence of the Son of God and that was enough. He deserves worship. Paul was so right when He wrote in Philippians 2:9-11 (ESV) “9 Therefore God has highly exalted him and bestowed on him the name that is above every name, 10 so that at the name of Jesus every knee should bow, in heaven and on earth and under the earth, 11 and every tongue confess that Jesus Christ is Lord, to the glory of God the Father.” That’s what He deserved as He walked with His disciples – that is what he deserved in the early church, that is what He deserves today and that is what will be bestowed upon Him forever as we see in the book of Revelation. So a true disciple is the one who obeys, whose loves to be in the presence of Christ and who simply wants to worship Him. Well, that's the message. Very simple this morning, the message is this, if you're a true disciple you're obedient, right? If you're a true disciple you want His presence, His power comes along. You just want to be where He is. If you're a true disciple you worship Him at His feet, you adore Him. I know none of us have experienced this fourfold miracle as experienced by the disciples on this day but as we go through our own experiences in life, are we willing to rest in the fact that just as Jesus was watching the disciples rowing against the wind on that night that He is watching us all the time. Jesus is watching to help:- But He doesn’t “help” until the time is right. There is indication that Jesus came down from the mountain significantly earlier than He helped them on the sea. Jesus is able to get you to the destination:- They were immediately there. Jesus is mightier than any circumstance:- To say it another way, what is difficult for us is no difficulty for Him. He moves through the storm effortlessly. He suspends the law of gravity in His own case and walks on water, and had the power to do the same for Peter. The wind ceased immediately after He got into the boat with them. Jesus has a plan for the circumstances that we find ourselves in:- Jesus sent them into this storm. The One who is able to calm the wind in a moment (they had already seen Him do this earlier), could have made sure that they never faced the wind in the first place. This is all about development, this is about learning lessons, and sometimes it’s about learning lessons that we missed earlier. May God give us grace to be true disciples who obey, who desire to be with Jesus and who worship Him?